On Tuesday evening, we left Fairbanks to Seattle. 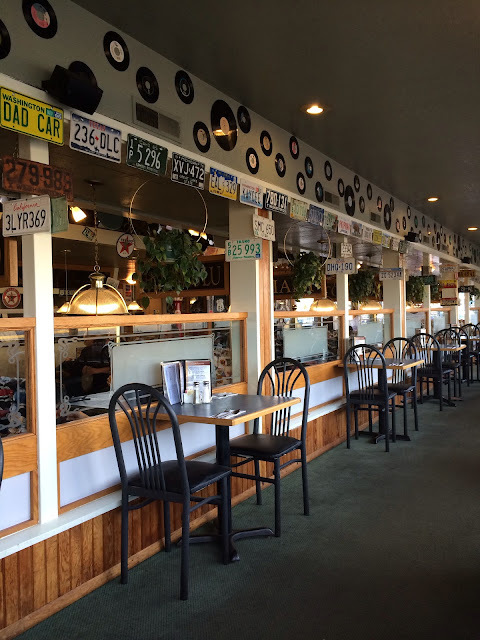 On Wednesday morning, we went to breakfast at Dave's Diner located less than a mile from SeaTac. Nice decorations and typical diner fare. Good food and too much in one serving. The decor was typical 60's diner on the outside but nicely finished on the inside. We flew out of Seattle at 1:00pm on one of the oldest and smallest 737s that Alaska Airlines had. Cramped and small luggage bins but it was a relatively short flight. The weather in Seattle was beautiful and it really felt warm though it was only in the upper 40s (°F). 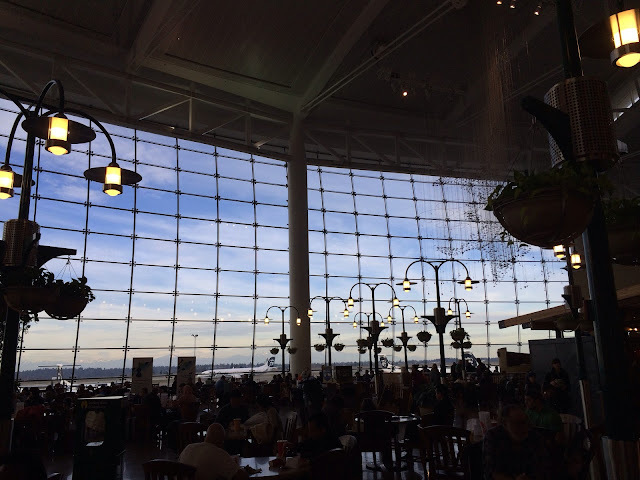 I still like the windows in the SeaTac food court. We arrived in MSP just after 6:00pm and after getting lost using Apple maps, I fired up the MotionX GPS app and we quickly found our way to the hotel in downtown St. Paul. We are here to spend Thanksgiving with Bridget's youngest attending school here. 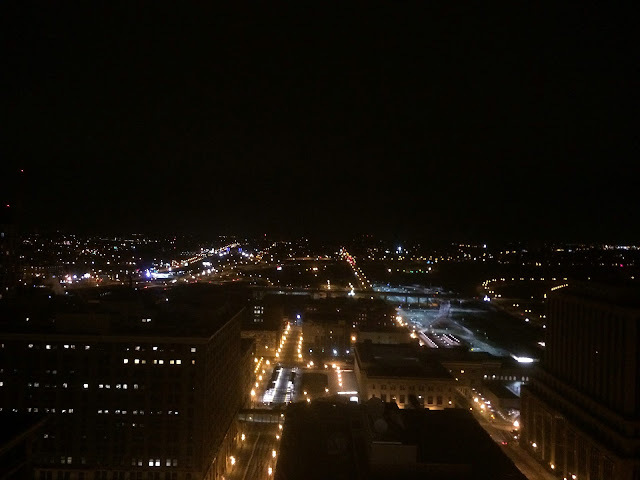 This is the view from his 29th floor apartment. The Mississippi River is on the right. Pretty nice. This was originally written using the Blogger app on the iPhone. Nowhere near as nice as the Blogsy iPad app. It came out looking horrible. Poor formatting, tons of "extra" html, no control of even picture thumbnail size. I fixed it in Blogsy later on deleting tons of the extra, useless code. Horrible app which has since been deleted from the iPhone. The easier solution is to simply delete the Blogger iPhone app. Welcome to my part of the world. I grew up a few miles from MSP. I'm about 3 1/2 hours northeast now. Nice area of the country you have here. The last time I was in Minneapolis it was -30°F and windy. By comparison, it feels pretty nice now. Your new design looks great and the header is perfect. The emissions on the horizon are perfectly placed, too! Thank you. We do seem to have plenty of emissions around here. Happy Thansgiving to you as well! Have a wonderful time away with family. I hope the weather continues to be nice for you. Great view from the apartment. But that picture for the blog header is very nice too. Thank you! It looks like it'll be clear for most of the time we'll be here. Even though it's cold, I still like visiting and seeing new places. Wishing Happy Thanksgiving and a wonderful time with the family. Thank you! Only a small part of the family here today. For those at home, I had prepared a Thanksgiving meal last Sunday so they can have plenty of leftovers. Happy Thanksgiving Richard, to you and your family. And Happy Thanksgiving to you as well (even though it's about a month late).